After a brother’s difficult life, his sisters find a way to help bring him peace. This piece concluded the Daily Hampshire Gazette's Dignity Project, a long-term, multi-author series examining end-of-life issues. Three-year-old Elijah Peltier of Shutesbury, Massachusetts, is autistic. His parents believe that what happens during the next three years is the key to his future. A year of intensive treatment for his autism has led to tension, turmoil and mixed results for Elijah Peltier and his family. Recipient of the 1998 Sunday Magazine Editors' Association Honorable Mention for Features. As kindergarten begins for Elijah Peltier, disturbing questions about this autistic boy's future keep growing. Winner of the 1999 Sunday Magazine Editors' Association First Place Award for Features. Once frantic to find a cure for their autistic son, Laurel and Chris Peltier now are trying to shape a community that can support him. A look at Elijah's life as he prepares to enter the challenging world of middle school and adolescence. 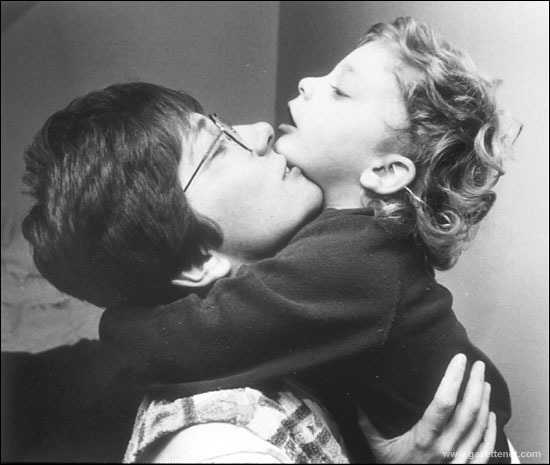 Four-year-old Jimmy Foard was born with Alfi's syndrome, a rare chromosomal disorder. It has handed him a host of developmental challenges that he and his family are learning to accept and overcome. The author, as a college student, makes a friend, and over the years learns about friendship's duty in matters of mental retardation, the horrors of Connecticut's Mansfield Training School, and the family secrets held by an impersonal bureaucracy. Neonatologist Dr. Kathleen Marinelli is on the front lines of a growing drive to re-establish breastfeeding as the norm for American mothers. When the Lutvak family set sail from New Bedford, Massachusetts, they thought they might be gone a year. They didn't know what challenges the sea had in store. When Jerrilee Cain purchased her early 18th century home, it was stacked in pieces in a storage trailer in Connecticut. Years of painstaking planning, reconstruction and restoration have given it a new life in rural Massachusetts.